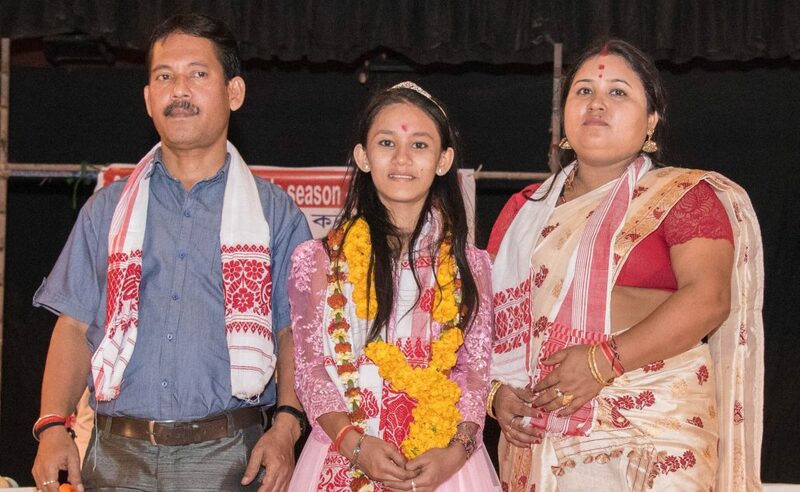 Manashi with her parents after receiving public felicitation at the District Library, Mangaldai. Manashi Saharia, the child singing sensation from a remote village, Udmari, bordering Darrang and Udalguri, who brought accolades not only to her home village but also to district Darrang and Assam by emerging champion in the ‘Voice India Kids-2’, a reality musical show broadcast by private television channel ‘&TV’, Mumbai received warm welcome on her arrival at her home district Darrang on Tuesday . Mangaldai Media Circle, a local body of media persons organized a public felicitation function at the district library auditorium in Mangaldai where around 50 public organizations and government agencies including the Darrang district administration, District Information and Public Relations Department, All Assam Students’ Union (AASU), Asom Jatiyatabasdi Yuva Chatra Parishad (AJYCP), Darrang Zila Sahitya Sabha, Youth Club Music College, Crystal Vision, Darrang Honda, SRD Group of Companies, her music ‘guru’ Renu Saharia and Chairman, Mangaldai Municipal Board offered Manashi and her mother Jitumani Saharia and father Anupam Saharia warm felicitations with traditional gamosa, Xarai, Japi, bouquet of flowers, books, citations, etc . While receiving a rousing welcome from the public in her home district, Manashi expressed her deep gratitude to the people of Darrang and Assam for supporting her all through the contest which lasted for more than seven months in a stretch. She explained how far she had to take up the challenges in Mumbai going from a remote village with little knowledge of Hindi. “The success I achieved at first was beyond my imagination. I had preparation of only four or five Hindi songs when I joined the contest in Mumbai. But I worked very hard to cope up the dream atmosphere,” said the little artiste. Talking to the Northeast Now regarding her goal, Manashi maintained that she wished to be a big singer like Bhupen Hazarika or Lata Mangeshkar and establish a state-of-the-art musical institution in her home district and guide the talented young singers of interior areas. Later in the afternoon, similar public felicitation function was also organized at her home village Udmari with massive public participation. Earlier on the day, she was greeted by her fans and well-wishers all through her journey from the Gopi Nath Bordoloi International Airport in Guwahati to her home village at different points of the district including Narikoli, Sipajhar, Aulachowka, Mangaldai College, Chapai, her academic institution Pride Academy, etc. as she along with her parents were picked up from the airport in a decorated open jeep escorted by a long motorcycle rally.